Ok, let’s go right to the kitchen and tackle that cupboard. You know which one I am talking about. The one that drives you so crazy that you end up just shoving stuff in. The dreaded plastic container cupboard. The first step is to empty it out. Take everything out and place it on the table. Go ahead and say what you are thinking, “Why do I have so much?” Next, match up a container to a lid. If it does not have a partner take it right to the recycling bin. Go on, let it go. Recycle the stained ones and ones that have never sealed correctly. Donate the ones in usable condition but you do not use for whatever reason. Now stack the containers by size, step back and look at how many you have. It’s really not necessary to save every single lunch meat, deli salad or cute little take out container. It’s OK to recycle most of them. Five or six is a good number to keep. They are perfect for sending home leftovers to guests. Don’t forget to add “you can keep the container” when handing over. Find the largest container you have or use a plastic shoe box size container and organize all the lids from smallest to largest. I know some prefer lid organizers but I have found they take up precious space and rarely fit well in the space you are working with. But what about the big round bowl lids? We will get to those in a minute. Stack the containers inside one another. Multiple stacks may be needed. Now those round lidded bowls. If they can stack inside one another that is ideal, but otherwise I stack the bowls with the lids underneath. 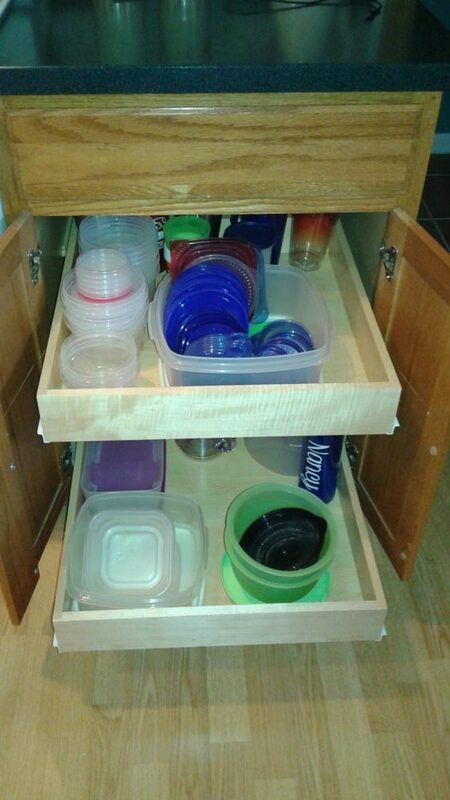 If you are using drawers I suggest containers in one drawer and lids in another. Once you have it all organized some maintenance will be required. Putting it all back in the correct spot after washed and dried is a must. After all, even the plastic containers need Room to Breathe.